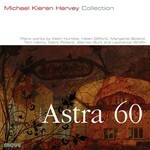 Astra 60 / Michael Kieran Harvey. Aardvarks II : Mr. Natural encounters Flakey Foont!, piano solo / Warren Burt. Dedication note: Dedicated to Keith Humble. In memoriam Carl Ruggles. 7 Mar 74: Festival of Contemporary Music Series, Ball State University, Muncie, Indiana. Featuring Virginia Gaburo. Dec 71: Composition seminar, University of California, San Diego. Featuring Keith Humble.